Are standard Air and Vacuum Valves mounted on a Surge Check Unit. The Air and Vacuum Valve operates in the normal fashion allowing air to escape freely at any velocity (maximum discharge velocity is approximately 300 feet per second at 6.7 PSI; however, good pipe line design restricts velocity flows of air to 10 feet per second which occurs at approximately 1 PSI). The Surge Check Unit operates on the interphases between the kinetic energy in the relative velocity flows of air and water. 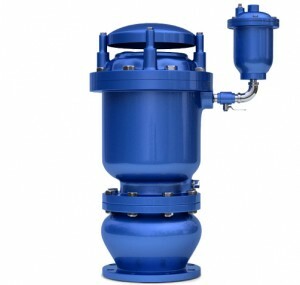 The Surge Check is a normally open valve, spring loaded, so that air passes through unrestricted, but when water rushes into the Surge Check Unit, the disc commences to close against the spring and reduces the rate of flow of water into the air valve by means of throttling holes in the disc. This ensures normal gentle closing of the Air and Vacuum Valve, regardless of the initial velocity flow involved and minimizes surges when the valve closes. As soon as the Air and Vacuum Valve is closed, the pressure on both sides of the surge Valve disc equalizes and the disc automatically returns to its open position. This means an Air and Vacuum Valve does not need an incipient vacuum to open, but can open at any time the water level drops and line pressure approaches atmospheric and immediately have full re-entry flow of air into the pipe line before a vacuum can form.